Kalendar prikazuje samo potvrđene rezervacije. Address of apartment: 7815 Harkány, Táncsics Mihály u. 2. Post address of owner: 7815 Harkány, Klauzál u. 4. This apartment is a private accomodation registrated by Harkány Local Government based on the Edict 239/2009. (X. 20.) of Hungary on detailed conditions of accomodation-services and the legal procedure on issuing accomodation-operation licences. Data administrators: József Győrmárton owner, Judit Győrmárton and Rita Deliné dr. Győrmárton in person, henceforward: Data Administrators. 1.1. Data Administrators declare that during any data handling they will act in accordance with the Act of Hungary on information self-autonomy rights and the freedom of information (Act CXII/2011). 1.2. Data Administrators have created the present DATA HANDLING HANDOUT for their guests (hereinafter: Handout) which can be reached on the official website and in the apartment (printed) both in Hungarian and English language. 1.3. Present Handout gives a general knowledge on data handling during the services by Data Administrators. 1.4. Personal data will be handled only for certain pre-specified reason and time needed, in order to fulfil requirements and profess rights. Data Administrators use only appropriate personal data only to the extent of purpose. 1.5. In some cases the way of data handling can alter from the statements of this Handout, and in this case the Data Administrators pre-inform the Guest, just as in all data handling procedures outside this Handout. 1.6. In case of valid assent of an underage guest, his or her legal representatives’ signature is required. 1.7. All data given to the Data Administrators are solely handled by them or persons in labour or assignment relations with them and only in case of labour duties with data handling. In case of providing services all data in connection with the Guests are given and provided by the Guests on voluntary contribution and its aim is to provide the accomodation (apartment) and keep in touch and introducing the Data Administrators’ services. All personal data stated under this section of the Handout are kept secure until the appropriate time due to tax and financial laws and are deleted after certain deadlines. At certain services other data may be recorded which help get to know the Guests’ special requirements, but these are not criteria to the Guests’ booking and staying in the apartment. in case of foreign nationality the place and date of entering Hungary (passport). By signing the GuestBook the Guest gives consent to the Data Administrator to handle and create archives to fulfil his duties and profess his rights. The Data Administrator complies with the Edict of Harkány Local Goverment 14/2007. (XII.17.) on local taxes. The Data Administrators do not apply newsletter-systems. The Data Administrators may periodically send e-mail to or call via telephone its former Guests – in order to keep in touch or inform them about an offer made exclusively for them. The personal data are stored separately from other data provided to the Data Administrators. Personal data are not forwarded by Data Administrators towards third parties. The Data Administrator ensures that anybody may contact him via e-mail. The website of Data Administrator may contain links which are not operated by the Data Administrator, these only provide more information for visitors. Data Administrator has no influence on websites’ content or security operated by other partners so will not take responsibility for these. The purpose of this page is to inform visitors on the Apartment and its offer. There is no camera system in operation at the Data Administrator’s Apartment. 3.1. Data Administrator handles the personal data confidentially and shall not provide access to them for unauthorized third parties. All personal data are kept safe in order they are not accessed, changed, forwarded, brought to public, deleted or destroyed, moreover cancelled or damaged by chance, or are not inaccessible because of the change of used information technological devices. Data Administrator shall provide all security steps needed to keep personal data technically safe. 3.2. Data Administrator uses personal data only to the appropriate extent and permitted purposes. In order to secure this they have taken obligation of confidentiality, that is of legal force even after the closure of the Apartment’s operation. 4.1. Data Administrator holds right to forward personal data without the person’s permission in cases described by law to relevant officials, courts according to specific request from them. 4.2. Data Administrator keeps record of forwarded data in order to ensure its checking of legality and to inform the person in case. The record contains the date, the legal base, the addressee of the forwarding, the specified personal data and all other data defined by law. Data Administrators are the persons responsible for data-processing. 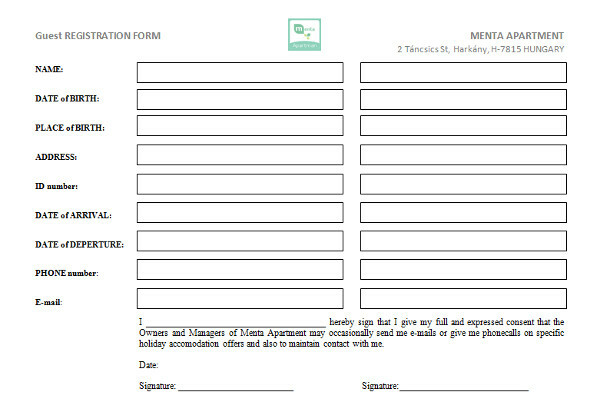 The Data Administrator gives information for the written (e-mail to info@menta-apartman.hu or letter by post) request by the person in case within a maximum of 15 days on the followings: his/her personal data, the source of these data; the aim, legal base, time of keeping the records; the name, address of the data-processors; the activities within keeping the records; the specific terms in question and their effects; all arrangements made to solve the specified matters; and in case of data-forwarding the legal base and the addressee of the forwarding. Data Administrator keeps record on the data handling in order to ensure its checking and informing the person in case. The record contains the personal data of the specified person, the numbers of people involved in the question arisen within the data protection, the time, circumstances, effects of the case in question; the arrangements to solve it, and other data defined by law. If the Data Administrator have to deny the information, he has to inform the person in case that denial happened upon which legal act and what kind of remedies the person may take. If the personal data does not correspond to reality and the right, real data is in Data Administrator’s possession, he corrects it. The Data Administrator informs the person in case and all others for whom the data have been forwarded previously. This information may be skipped if the correction does not violates the interests of the person in case. If the person in case asks for correction than the procedure is due to the procedure stated under section 6.1. In cases of deleting, blocking and objecting the data handling the sections 17 – 21 § of the Act of Hungary on information self-autonomy rights and the freedom of information (Act CXII/2011) are to be followed. In case of infringement of personal rights the person in case can go to law. The court procedure is under the section 22 § of the Act of Hungary on information self-autonomy rights and the freedom of information (Act CXII/2011). The Civil Code of Hungary (Act V/2013) First Part 2:51. § – 2:54. § are to be followed as well. If the Data Administrator causes damages or offends a person by illegal data handling or abandoning the data protecion rules, restitution can be asked from the Data Administrator via legal procedure. Data Administrator is not liable for compensation or restitution if the damages or offends have been caused by an unavertable cause beyond his data handling activity. Data Administrator must prove this. Data Administrator is responsible for the damages caused by the data-processors and as so he is liable for paying restitution for personal damages or offends caused this way. No compensation or restitution can be required when the case occured because of the guest’s deliberate or negligent conduct. Data Administrator holds right to amend this Handout with informing those in question. Data Administrator is not reliable for the trueness of data given to him by the visitors of his website and his guests.